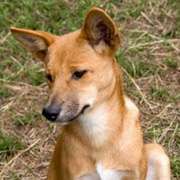 (PhysOrg.com) -- Studies in the past have shown that wolves are smarter than domesticated dogs when it comes to solving spatial problems, and now new research has shown that dingoes also solve the problems well. The dingo is considered a “pure” prehistoric dog, which was brought to Australia tens of thousands of years ago by the Aborigines. While they have in the past been associated with humans, they have adapted to surviving “wild” in the Australian outback. The dingo lies somewhere between the wolf, its ancient ancestor, and the domestic or pet dog, and has cognitive differences between the two. There has been little research done on dingoes, even though studies would aid in the understanding of the evolution of dogs, and it was unknown whether the dingo was more “wolf-like” or “dog-like”. Researchers in South Australia have now subjected the Australian dingo (Canis dingo) to the classic “detour task,” which has been used by previous researchers to assess the abilities of wolves (Canis lupus) and domestic dogs (Canis familiaris) to solve non-social, spatial problems. The detour task involves placing a treat behind a transparent or wire mesh fence. The dog can see the food but cannot get to it directly and has to find its way along the fence and through a door and then double back to get the food. Previous research has shown wolves are adept at solving the problem quickly, while domesticated dogs generally perform poorly and fail to improve significantly even after repeated trials. The wolves were also able to adapt easily when conditions were reversed, but pet dogs also generally fared poorly at this task. Until now dingoes had not been tested, so lead researcher, PhD student Mr. Bradley Smith of the School of Psychology at the University of South Australia, decided to subject 20 sanctuary-raised dingoes (Canis dingo) to the V-shaped detour task, in which a V-shaped fence is the barrier to the treat (a bowl of food) placed at the intersection point of the V, and the detour doors swung either inward or outward. The dingoes were randomly assigned to one of four experimental conditions previously used to test dogs and wolves. These were the inward or outward detour (with doors closed), inward detour (with doors open), and inward detour (with a human demonstrator). Each dingo was tested four times and then given a fifth trial with the conditions reversed. The results showed the dingoes completed the detour tasks successfully, and they achieved fewer errors and solved the problems more quickly (in around 20 seconds) than domestic dogs tested in previous research. Unlike domesticated dogs in previous studies, the dingoes did not look to humans for help, and only one dingo even looked at the human when solving the problem. This behavior was much more similar to findings with wolves than for pet dogs. The findings were published in the journal Animal Behaviour. All tests were carried out at the Dingo Discovery Centre in Victoria. Black wolves: The first genetically modified predators? They must be using some pretty stupid pet dogs for these studies. Our small breed dogs (and cats) solve these types of problems all the time, and with no training. My lab would just eat the fence then the treat. Then she would eat the door while waiting for the next treat. There's so much variation amongst the domestic canines, it should really be accounted for, which of the many breeds was used in this study? There is difference between the inteligance of the dog, and the woolf, we teng to think that learning of commands is inteligence, if they were trying this the dog will beat the wolf, the dog has adapted not to solve the problem by itself but to try to figure what the human wants now, the wolf is inteligent . I owned a wolf-shepherd Hybrid. WE were moving, permanently relocating as opposed to a casual trip or vacation. I was finishing loading the trailer when I felt a 'bump' as if the car had gently moved. I turned around and walked out of the Uhaul trailer and tbere was the bag in which I kept all of her toys. I turned to look at the car and there was my dog. I turned toward the house, wife walked out locked the door and saw the dog and bag. I asked her if she had put the bag there, she said no...and yes, I knew my dog could get in and out of the car without help, but the TIMING was beyond canny! Like the time my dog stole the meat out of my sandwich...no teeth marks, no mess! To be blunt, this problem-solving experiment could have replaced the word "dogs" with "humans". Some can solve problems big and small by themselves, others look for others' guidance and commands, some have no clue what to do. If Aborigines settled Australia ca. 50k yrs ago and the Asian wolf was only domesticated/transformed into dog about 15k yrs ago when was the dingo brought into Australia? How did the Aborigines sail the ocean in both cases? I think the abstract didn't properly explain the result. The title certainly didn't. The primary focus of this research is to show the inherent bond between canis familiaris with humans and how dogs look to human beings for cues on what to do where as wolves and dingoes do not due to selection pressure via domestication. How did the Aborigines sail the ocean in both cases? They didn't, they walked. The Aborigines weren't isolated until after about 10,500 BC when the sea levels rose catastrophically after the ice dam break in the Laurentide Ice Sheet, or so the current theory says. If my lab puppy wanted in a room and the door was closed, she just ate through the dry wall. That's why she doesn't come in the house anymore. Nort surprising that dingos and wolves score higher on canine intelligence tests. Intelligence is something you need to train. Survival is something that keeps you on your toes 24/7. Pet dogs don't have such an intensively stimulating environment. Life/death situations just focus the mind a lot better than "good dog"/"bad dog" ones. That seems like a logical outcome of the article. Why aren't you writing these? "Posters, like skeptic_heretic, are smarter than physorg writers"
Yep, pretty much what skeptic said. If this research was meant to show that domestic dogs are more dependent on humans than wild ones, then it was "successful". If it was meant to show that wild dogs were smarter than domestic dogs...well it didn't even address that question. Thanks for the compliment but I wouldn't go that far. I'm simply well read. Although I agree that domesticated dogs have become dependant on humans, I'd assume that some of their natural intelligence would have suffered (take the puppy of domesticated dogs and leave it with wolves or dingoes and the differences in behaviour between that puppy when it matures and the others should be obvious). In survival of the fittest, spatial ability would have been much more important to a wild animal than to a domesticated one. Selective breeding in dogs focused on physical traits and social intelligence (http://en.wikiped...havior). Of course, the interactions of nature and nurture arise again, but I'd assume that spatial ability isn't as important for the average domesticated dog, because during the animal's life, it wouldn't have been challenged very much, so there'd be no need to breed for it. Also, "domesticated dogs generally perform poorly and fail to improve significantly even after repeated trials." This seems to support nature. If they walked why another animals didnt do the same thing, and why humans and the dingo are the only placental mammals on te continet(ofcource before europians invaded)! Couple of things, first, you're incorrect. There are a great many more placental mammals on the islands, ie: Bats, many forms of rat, the Duck Billed Platypus (which is an offshoot of protomammilia found no where else in the world). So your question is complete horseshit. There are also several forms of earlier lizard, land turtle, etc. These creatures did not swim or boat there, and couldn't fly there if they wanted to. Second, the Dingo, being an intermediary isn't represented elsewhere, which shows geographical isolation was the cause for their divergence. See you can find stupid theories for lots of thing the fact that you are well red must be usefull to deside which is wrong and which can be true! That's why I keep reading and stay current. Which you seem to not want to do. I'd assume that some of their natural intelligence would have suffered (take the puppy of domesticated dogs and leave it with wolves or dingoes and the differences in behaviour between that puppy when it matures and the others should be obvious). Well that's the same as taking a boy from China when he is born and raising him in America, he'll act American. The two species you refer to are canis lupis and canis lupis familiaris. Dogs and wolves aren't distinct species, they're capable of interbreeding and share almost all phenotypical attributes (dogs express many more recessive traits than wolves). Ok, kangaroos, how about those? What about capybaras? How about every single marsupial? All of which are pre-evident placental mammals? Where did you get your education? You might want to return it for a refund. Especially when you're attempting to tell me that my reasoning skills are weak. You're a simple troll. I feel as though natural selection plays a pretty big part in this. Wolves and dingoes need to survive on their own. Those that can't survive won't pass their genes to the next generation. Pet dogs are bred specifically for looks and breed and intelligence generally doesn't play a factor in their breeding (sure maybe in show dogs and that kind of thing, but I referring to the piles of puppies at pet stores). The stupid pass on their genes just as readily as the smart. After a number of generations it seems sensible that wild canines would be smarter than domesticated canines. You've made 4 posts in the last 25 minutes. I'm sorry, but you care a lot. Perhaps you should go back to reading the articles rather than commenting if intellectual conversation pisses you off. Thanks for pointing that out @dave. I was going to mention that many dingoes across southeastern Asia it appears that dingo was probably transported to Australia about 5-10K years ago from Asia by fishermen whereas Aborigines have been there much longer and may have walked most of the way. If they had to swim or float it was not a great distance, probably enough to slow down the travel of many other animals that may have otherwise traveled there. And they did, many of which died out as Australia became drier. There is a competing theory that the aborigines effectively killed them off once isolation set in as they were one of the few reliable food sources. So you're effectively telling us that people boated marsupials, which are found almost nowhere else in the world, to that set of islands. So tell us why they did it. Go ahead and give this a read. So then classify otters, beavers, weasels, seals, and walrus for me would you? The red fox isn't a native to the island, nor was it in it's current form 40,000 years ago. hopping isnt equal to walking here=> you need boat! they have walked in ocasion that they are Crist desendants and they have inherited this from him!!! No source, you probably made it up or brought it out from an out of date textbook. Secondly, how would you explain the fossils of non-sea going humans that we have identified on the islands? How do you explain the presences of non-seafaring homonid species fossils? just to reiterate on several comments before - i'd like to see research with feral dogs (the pet kind). the research just doesn't make sense to me - and did they test mutts and/or true breeds? Furst the article didnt mention lend bridge from Asia to Australia, it dose but for islands near Australia and New Guinea, and you are a lier calling me lier, look the 18-th line, in the section arrival. You are really slippery arent you, we are talking for Australia now it is not the same everywhere or this is one of you basic rules..hahah hilerious....and the fox is just an example, if you want a nice example why not the mongooses, or the different species of civets, placental mammals even semy domesticated thrive(even the domesticated cat is living in the bush) in Australia, you have 60 species of placental species in Singapur, why they arent in Australia. You do understand what a habitat is, right? Tell me how the interior desert of australia and the singapore rainforests are similar. The red fox was reintroduced by ENGLISHMEN for the purposes of sport hunting, much as the Siberian Hog was introduced to the Midwest. You're braindead. Why? What refutation have you provided? DJ, If you're unable to read even the most basic of articles and follwo the sources down then what good is having any form of conversation with you? You keep asserting there is some lack of placental mammals in Australia, this is entirely wrong, and you've spoken to that point several times now. Then you said that placental mammals aren't aquatic or partially aquatic, again, a completely ridiculous assertion. Now you're saying that Australia and Singapore have a similar environmental niche arrangement, which is entirely false. You haven't provided one factual statement throughout this entire conversation. Just what are you trying to argue here? Beer never came into this. Finally, the half truths and full on fallacy will stop. Ok, kangaroos, how about those? How about every single marsupial? Non placental, that is why they are called marsupials after all. Heck, you even explicitly called the platypus placental and they lay eggs. They were native to Australia before men came. There were NO placental non-flying animals before men came. You hardly ever blow it this bad. Never before that I saw anyway. I seriously doubt that either humans or dingoes walked a land bridge. The water between New Guinea and Australia is WAY to deep for that, as in Abyssal. My guess is a raft for the Aborigines. Dingoes seem to have come later as another poster suggested. And yes I looked this up to avoid saying something stupid. Which I otherwise would have. Check before posting. Even if your sure. You know what, you're absolutely correct. On rare occasion I allow someone to bait me into a position I shouldn't be in based on information I haven't followed up on recently. I disagree that there is an abyssal depth between the land masses however I can follow up on that shortly. DJ, good work at getting me to perform an action I rarely perform and often regret. Feel free to gloat. I'll recant for now. If I'm wrong, I admit it. If more people would do so we'd have fewer problems in the world today. And probably far fewer religions. In the argument about a land bridge to Asia there is the simple matter of the Wallace Line that runs through the middle of the Indonesian Archipelago. One type of fauna of one side like the Sumatran Tigers, rhinos, buffaloes and hypos and not on the other side. The reason is that even with successive ice ages over the last 3 million years there was never a land bridge across the Wallace Line. If there was we would have the whole Javan and Sumatran collection of Sumatran Tigers, rhinos, buffaloes and hypos in Australia and kangaroos and wombats in Java and Sumatra. Anything that could not sit on flotsam like mice did not come. Therefore the first aborigines could not have walked over the Wallace Line and did not just walk into Australia. They crossed water. There is also other linea called Lydekker Line and the Weber Line between the Wallace Line and Australia/Mew Guinea. For 50 millions years these have marked a deep water barrier during and between ice ages. That's why there are kangaroos in New Guinea but not in Timor, Flores or Sulawrsi.